The folks at AbeBooks put have together a fascinating Flickr album of vintage propaganda posters specifically related to food. It might look like a great source of images for ironic kitchen decor, but it’s really a fascinating and sometimes unsettling chronicle of how various governments tried to influence public eating habits over the 20th century. They also offer a peak into how wars are often experienced, even for those who aren’t on the front lines—as hunger. They’re not promotional posters, meant to sell, he explained—though you’ll certainly see plenty of such recipes and ads kicking around hunting grounds for ephemera hunters, created by companies or trade associations dedicated to sardines or vegetables or some appliance. Rather, these are meant to change behavior. “They want you to change your behavior around food,” Davies explained, and were most often created during wartime. Prominent themes include eliminating waste, eating healthy, self-sufficiency, and labor and production—for instance attracting women into agriculture, as well as producing the right kind of foods. They’re fascinating for what they’re saying without actually saying it. In the Soviet poster from the 1960s cheerfully touting the benefits of something called sprat fish, you can see the limited number of options available, hence the government talking up the many ways you could (supposedly) use this plentiful product of the Baltic. 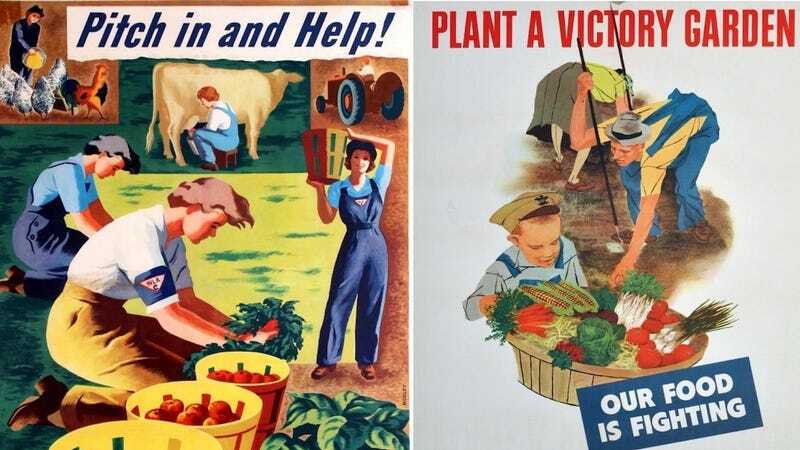 In the American posters, you can see that as a nation, we love two things: victory, and the idea of gardening and canning the results. Do we love the reality? Jury’s still out on that one. But it’s also a reflection of the comparative positions of the two countries in World War II. Compare the bounty of that American poster above, on the left, to these posters from the UK in 1940, which go heavy on the guilt-tripping because Britain was blockaded and conserving food was a matter of utmost urgency. Even decades away from the reality, these posters will make you feel compelled to start composting your banana peels. Or perhaps feeding them to my rabbits I’m breeding for the stew pot? Note the appearance of hedgerow weeds as an easily scavenged food source for the creatures—Davies pointed out that’s also where you get rose hips, which appear in a 1940 poster, proclaiming they’ve got more vitamin C than oranges, which German submarines had made it impossible to obtain. All of these are actually available for sale on AbeBooks; Davies said they might run anywhere from $300 on the low end. “The ones that have survived until now were never put up on a notice board somewhere, so they’re pretty rare,” Davies explained, and all these would have been in active circulation. It’s lucky that any are still around. This is a bald-faced lie, though. Potato lunch will make you drift off to sleep at your desk—forget a rousing afternoon game of cricket. LIES! Throwback Thanksgiving: Jellied Beef and Frozen Vegetables, Such a Miracle! Throwback Thanksgiving: Ladies, You Can Include Evaporated Milk in Absolutely Anything!